Here is another recipe from our weekend wine-tasting. We served this as the main course, paired with a nice bold Cabernet Sauvignon from Avalon Winery and a fun red blend called Ménage à Trois. This was probably the favorite dish of the night! The meat was so tender and juicy. 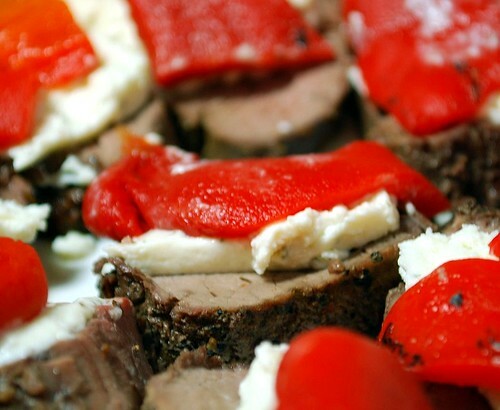 The Boursin and roasted red peppers melted in your mouth, just like the tenderloin did! This is a great recipe for an upscale summer cookout with a crowd. One tenderloin easily fed all 10 of us! Preheat your grill to medium-high heat. Tie your beef into an even, round roast if necessary so that it will cook evenly. Season the outside of the roast generously with salt and pepper, or a seasoning rub of your choice. You can also spray or brush the meat with olive oil to prevent sticking. Using metal tongs, apply the meat to the hot grill, browning and caramelizing the surface of the meat, turning until all sides are nicely seared. Turn the grill down to low heat (or move the meat to a lower-heat area of the grill) and continue to cook until a meat thermometer inserted into the center of the tenderloin registers between 120-130 degrees (for medium-rare). Remove the meat from the grill, cover it lightly with foil, and allow it to rest for 15-20 minutes. The temperature of the meat should continue to rise about 10 degrees as it rests. 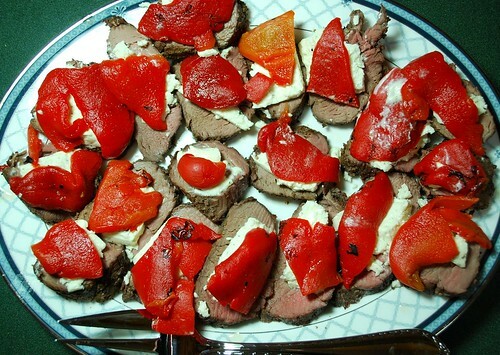 Meanwhile, pour your roasted red peppers into a microwave-safe dish and heat for about 30-45 seconds, until the peppers are fragrant and steaming. After the meat has rested, cut your tenderloin into 3/4″ slices and arrange on a large platter. Top each slice with a generous slathering of Boursin cheese. 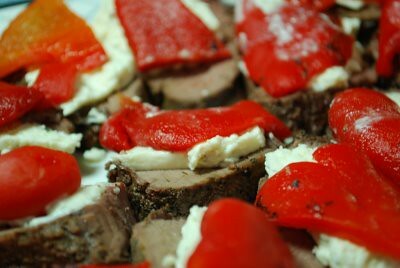 Then layer a warm roasted red pepper on top. Serve immediately.